Have you ever tried to de-clutter your kitchen, and had problems deciding what to throw away? Or have you moved to a new place, only to wonder where you should start in rebuilding your cooking haven? Here is my own personal list of my top 5 “things I must have.” I have cultivated this list over almost a decade of constant moving and rebuilding, in dorms, apartment kitchens smaller than many closets, shared kitchens, and the few times I’ve had unfettered access to large kitchens with lots of space and appliances. I find that most of the same basic rules apply! I’ve excluded my experiences in kitchens in which I had limited or no electricity or limited or no water, for the sake of streamlining to the majority of people reading this. But if you have such limited utilities and want to talk about maximizing the cooking fuel or water you do have, I’d be happy to hear how you manage and to discuss those situations as well! Just make a comment below! Do you really need both? Perhaps a few people out there may feel like they do, but most of us usually only use one or the other the vast majority of the time. The main difference is that a food processor will chop things up without making the food too fine; a blender will cream and pulverize ingredients for extra-smooth shakes or soups. 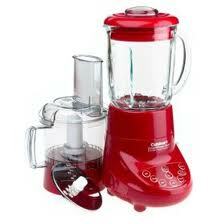 I generally prefer a processor to a blender, but only because I don’t tend to make many smoothies. Plus, there are other ways to make relatively smooth soups, like gazpacho for instance. (Recipe to come!) Just think–just like there was ice cream before ice cream makers, there were creamy soups before blenders! If you really feel that you can’t get by without both, you might want to consider killing two birds with one stone with a duo blender-processor. Cuisinart, for example, has a few options for less than $100. I’ve also heard good things about Magic Bullets. 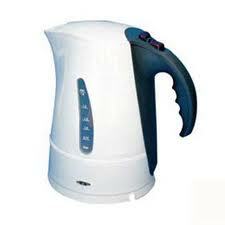 The electric kettle. My exception. Photo from diytrade.com. I find that many meals–whether from scratch or from a box–call for boiling water to be added to something. Save time by investing in a teapot–even the old-fashioned ones usually come to a boil faster than an open pot, and you can more easily control the amount of water you use (and waste). Any water you don’t use can simply be reserved in the teapot for next time. Electric kettles make for almost immediate gratification, which, depending on how often you use it, can make a big difference in your cooking. Even if I do generally discourage electric appliances, this is one of the main exceptions that I make for myself. It can be a real timesaver if you need to bypass the drip coffee machine by using it either with a French coffee press or instant coffee in a pinch. Finally, I find that it actually encourages me to drink more tea, which is always a good thing. Note how the blade extends into the handle on this Henckel's Chef Knife. Photo from zwilling.com. Yeah, this may sound obvious, but I ignored this one for many years thinking it just wasn’t THAT important. A sharp knife makes a world of difference in almost all your meals, from slicing strawberries for dessert to dicing onions to peeling yuca and trimming and cutting through meat. Of course, it’s fantastic if you can invest in a number of sharp, quality knives specifically designed for meat, vegetables, bread, or for paring; but really, if you have to minimize and you only get one shot, make it just a really sharp, quality knife, and a chef’s knife if you can, which should be able to do most of all of those functions (except for maybe the paring). Look for knives that are made from one solid piece of metal. If you can, avoid those that are comprised of a piece of metal attached to a second piece, usually plastic, for the handle. One-piece knives are stronger and you don’t have to worry about them breaking off in your hand on a particularly difficult cutting job. Finally, I prefer a straight blade to serrated because of the clean precise movement it makes, not only affecting the chi of the food but also just the ease of cooking and the time and effort you have to put in (which, in turn, affects your personal chi as well!). 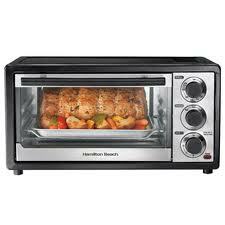 Depending on the type of toaster oven you get, you can do much more than just reheat and toast things. Photo from hamiltonbeach.com. If you are a person who’s constantly on the go, you may adore your microwave. I completely understand; I was once a constant microwaver myself. But now, aside from the occasional leftover reheat, I have almost completely taken the microwave out of my life. Health reasons and simply texture and taste have converted many from the deceptive simplicity of microwaves to the beauty of cooking with toaster ovens. Why a toaster oven? Well, it usually can cook anything from veggies to meats without the preheating required by regular sized ovens, and it can usually work in only a little bit more time than a microwave. Also, it actually bakes the food (rather than just radiating it) so that you can achieve the crispy texture or browned edges you may be going for, instead of the scalding-hot-on-the-outside, ice-cold-on-the-inside, gelatinous goo we often end up with when heating something up in the microwave. When I lived in Spain I was only given a microwave in my apartment. Meaning, no oven, just the microwave. So I invested in a toaster oven and was worlds happier for it. When I lived in Maryland, I had the oven but no microwave (and hardly any space for it if I were to have one–gotta love small East Coast apartments!). In both cases, the microwave was not missed. So if you have to minimize and choose one, I’d say go for the toaster oven, or even stick with the regular oven over a microwave. You’ll be healthier, and your food will taste better, with very little time sacrificed. 1) A decent spice rack. 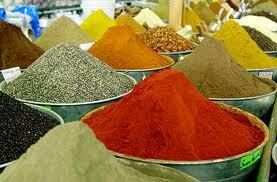 One of my favorite things about open-air markets: the spice section!!! Photo from ravirajspices.com. Spice racks are number one for a reason. Even if you have no food processor, no teapot, and even no toaster oven or microwave, if you have any source of cooking fuel you have to have a good selection of spices in your kitchen. Granted, spices are not hardware the way a knife or appliance is. But, spices are just so darned important to the quality of your cooking that I had to put it in here. They are the first thing I go shopping for when I move to a new place, just ahead of the sharp knife. It perhaps goes without saying that salt and black pepper go first. I tend to prefer a big bottle of sea salt, and whole black pepper that comes in a grinder bottle so that it comes out fresh every time. I also often use grated parmesan cheese as a flavor enhancer with a wide range of meals, to add a little extra saltiness and depth to the flavors of the food. After that, your most important spices will depend on the types of meals you most frequently make. This will include “non spice” additives such as particular staple ingredients that can last a long time in your cupboard or fridge, that give a particular flavor or texture to your food. For instance, if you make a lot of South Asian meals, you’ll want curry powder, maybe some cardamom, and perhaps some ghee (which is not a spice but still essential). If you are more into Southeast Asian cooking, you may prefer to have Thai basil and (your non-spice) coconut milk on hand. Do you cook a lot of Tex-Mex? Then you might prioritize your stock of dried habañero, jalapeño and cayenne on your spice rack. Think of your own preferences, and then make sure that you are always fully in stock with the ingredients you love most. This may also help to encourage you to experiment with them more often to create fusion meals that are all your own. My own fall-back cuisine is Mediterranean-influenced; so I tend to have a lot of sweet basil (dried as well as fresh), oregano, parsley, paprika, and olive oil in my kitchen. I also like to keep on hand some ground dry mustard, coriander seed, cinnamon, cardamom, unsweetened cocoa powder, vanilla pods, and some lemons for fresh juice and zest. To sum it up: pick the spices that you love most, and make sure you have enough of them on hand to experiment when you’re feeling creative! I love this list! I have to say, I use both the food processor and the blender and would have a very hard time choosing what one to part with if I had to. I also have Henkils knifes and just recently learned that the sharpening tool that comes w/them is to only help maintain the knife’s sharpness….I seriously need to have my knives professionally sharpened. Good list, and I do agree…the fire extinguisher should be on this list (note to self: learn from others! hahaha!) Hope you got some good eye candy that night!